There are around 13 million differently-abled people in Russia, over 604,000 of them being children. A vast majority of around 70 percent people believe that equal conditions and opportunities for people with disabilities have not been created in the country, allowing myths about them to persist. People in Russia do not often speak about those who are differently-abled, or not like most others. Russians get most of their basic information from the media and social networks. 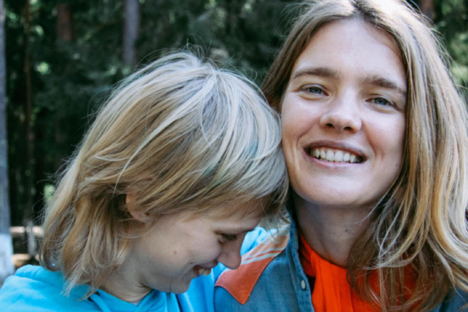 In the summer of 2015, the famous model Natalia Vodianova wrote on Facebook that her younger sister, who has autism and cerebral palsy, was thrown out of a café along with her caretaker. Shortly after this post appeared, the Russian Investigative Committee launched a criminal case against the café for violating the rights of a person with disabilities. The cafe owners were fined three million rubles for the offence. However, the case was dropped in court the following month after the two sides reached an out-of-court reconciliation. Vodianova said in an interview that "most people act this way not because they are bad, but because they have no information. We need to educate people." In late October, Russian Facebook users, and later the media, got interested in the story of seven-year-old Masha, who has Down’s syndrome. Masha's mother works as a teacher. She had no one to leave the girl with at home, so she took her to school. Masha sat in the last row and spent her time drawing quietly. Everything was fine until the class decided to take a group photo. The photograph of seven-year-old Masha made it to the photo album. At this point a scandal broke out when the parents of the students returned the printed albums with a request to remove the child with Down’s syndrome. Five students have already transferred to other classes. According to a Russian Public Opinion Research Centre (VTsIOM) poll, 17 percent of Russian adults with children and grandchildren object to their children studying in the same class as students with disabilities. Kolesnichenko said until there is more interaction in Russia, myths and prejudices will continue to circulate. Such myths suggest that children with Down’s syndrome are dangerous, have learning disabilities and are the fruit of their parents' anti-social behaviour. For journalist Yekaterina Men, life changed nine years ago when her two-year-old son was diagnosed with autism. "From the point of view of the system, the child was seen as garbage,” says Men, who now heads the Center for Autism Problems. “I believe that my child is of a great value. My activity was born out of this contradiction." "I was faced with the fact that there was no help for the child,” says Men. “I had to either leave the country and take him to a place where there was actual help, or do something for him here. And when I started doing it, I realized that it is impossible to do it for only one child, that the changes must be systemic. " First, Men began to fight for the right of her child to attend public school. Four years ago, her association developed an inclusive model to ensure that children with autism would have the opportunity to integrate into the mainstream education environment. "For this, it was necessary to educate people who would teach him, because they simply did not exist,” says Men. “A model of inclusion was created, which was used to prepare specialists, as well as School No. 1465 (in Moscow – RIR). Now, attempts are being made to implement this model in other schools. We now educate 22 children with autism, who previously had no chance at all to get into the education system." Men admits that she managed to implement her plan because of help from the Galchonok charity fund, as government funds are not sufficient. In 2015, the average benefits for registered people with disabilities in Russia are slightly less than 11,000 rubles ($170 – RIR). Families have to rely on themselves or donations. The Sozdaniye charity foundation is trying to help everyone that needs it. The organization acquires and maintains necessary resources, ranging from dresses and toys to medical equipment and technology. The foundation's director, Yelena Smirnova, believes that everyone can help and not just financially. "We need to do more joint events, where all the children play, sing and create together," says Smirnova. "In such a way, we will teach children to treat special-needs children as equals, and their parents not to fear, but rather to encourage communication with children with special needs. It is extremely important that children should make no distinction – except to help those that need help." In April 2015, a spokesperson for Pavel Astakhov, Russia’s ombudsman for children’s rights, said that the number of children with disabilities in Russia had increased by almost 10 percent over the past five years. But as of now there is no unified state registry of such children. According to the children's ombudsman’s office, there are many community organizations that provide assistance to children with disabilities now, but "no systemic work." According to the Federal State Statistics Service, Rosstat, Russia is home to almost 13 million people with disabilities, with more than 604,000 of them children. A total of 75 percent of the population believes that problems concerning people with disabilities are quite neglected, while 67 percent say that people with disabilities do not have the same opportunities for education and employment as other people.